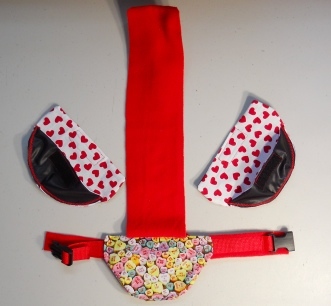 This Goose Diaper Holder Harness is made with Candy Heart/Valentine's Day Print, backed with a waterproof fabric and it is oh so cute. It has a small ring for a light weight leash with a small hook. This Goose Diaper Holder can be lined with a sanitary napkin, a human baby diaper, a folded newspaper page or other folded papers. 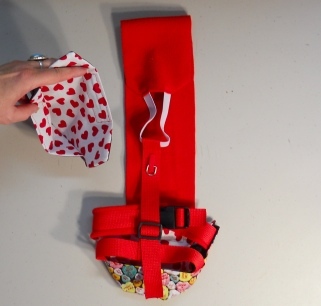 It comes with two matching (red hearts) print liners that are each, like the Diaper Holder backed with a waterproof fabric. The liners velcro into the Goose Diaper Holder Harness, but of course you could also use the Diaper Holder without the liners if you like or if they became soiled. 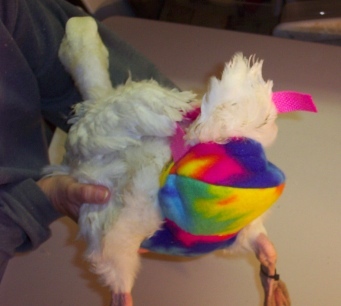 The two liners and the Goose Diaper Holder are hand or machine washable in cold, hang to dry. THE RING ON THE DIAPER HOLDER/HARNESS IS MADE FOR USE WITH TAME/TRAINED DUCKS OR GEESE AND A LIGHT WEIGHT LEASH HOOK AND LEASH ONLY! (it is metal and shiney but placed where you goose should not notice it) If your duck/goose is not trained to walk with you, or is not leash trained, or if the Diaper Holder/Harness is not properly adjusted, your pet may come out of it.